Lilly Pulitzer's new collection is full of gorgeous new prints, classic white dresses, and fun unique pieces. It's all that we love about Lilly and more. Here are some of my favorite pieces that are available on Lilly Pulitzer's website right now! Left: This cropped blazer is super adorable! It kind of reminds me of a Chanel blazer except this one is obviously a fraction of the cost. The combination of the pinks, purples, and some blue in the jacket will make it easy to pair with simple pieces for spring. 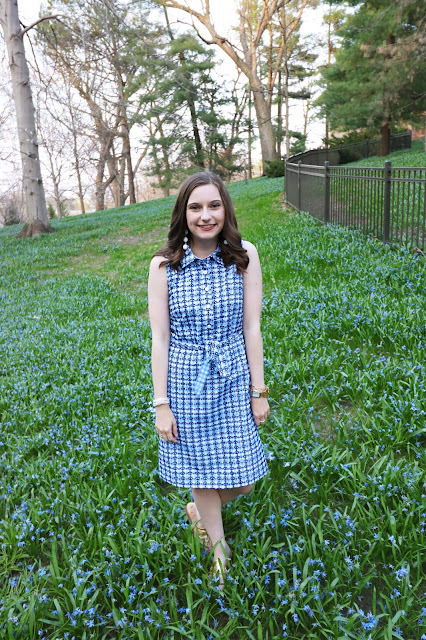 Right: A navy nautical dress is a great staple for spring. You could dress this up or down and even wear it in the winter with some tights. Left: In this collection there are a ton of beautiful white dresses! These would be great to buy and to keep for rushing if you are in a sorority. There are great silhouettes to choose from that are super flattering. Right: I am loving this patterned floral blouse. It is super classic without being old and frumpy. I like the bold print and colors in this Lilly pattern as well. Pair this top with white or normal jeans and you have a great spring look.